On Tuesday, I will leave home for my 2015 Great Grand Genealogy Tour, the GGGT of the Plains States. I've been preparing all year, especially last month. There's not much preparation left to do except announcing it! Read on if you'd like to follow where I'm going, what I'm doing, and why I do it. This is a Google map with points of interest. I couldn't get it to embed in the blog this time. You will want to make sure that you select only "GGGT 2015" in the sidebar. This tour is dedicated to my ancestors that are buried in ND, SD, MN, and IA. According to my best data, there are 45 of them, in all four of my grandparents' branches of the family tree. These include 24 graves that I've never seen before, 11 that are not on FindAGrave.com, and four whose locations are unknown. One of my main goals is to find the graves that have been lost to memory, and to preserve their locations, e.g. on FindAGrave. You can find my FindAGrave profile here, which includes links to graves I've already saved. The four lost graves have been my main focus of preparatory research. On my dad's side of the family, I have been persistently trying to track down the grave of my 3GGF John Anderson (Grandpa Fagerland's father's mother's father). I actually just learned his name this year. I have found a very strong candidate cemetery, and I'm in touch with an adventurous church secretary who got hooked on my search and would like to show me how to hike up the hill to find it. The cemetery is called Trinity, outside of Montevideo in southwestern MN. It is the former site of Trinity Lutheran Church, where John's daughter Mary and her family worshipped. I know that there are some Anderson graves there, but I can not yet confirm that 3GGF is one of them. I know that he died between 1885 - 1895. Unfortunately, the Trinity church records from 1885 - 1896 are lost! I hope to find his death record and / or obituary at a local county office or historical society. They can not do the search at a glance with a decade-wide window and a common name. This is the exact kind of thing that I can not do remotely, so I have to be there on site. While out there in Fagerland country, I am hoping to learn a little more about my enigmatic 2GGPs Ole and Mary Fagerland (John Anderson's daughter). I've never seen a picture of them. Grandpa Fagerland says that his family's photos burned down in 1930, which means that neither he nor any of his siblings' families would have such a photo. I had to track down one of Grandpa's cousins in hopes that a photo might have survived. There is only one surviving branch, descendants of Grandpa's aunt Elizabeth Fagerland, and she was estranged from the family a century ago! Nevertheless, Elizabeth's granddaughter Darlene got curious about her roots and started contacting Fagerlands in the 2000s. I got in touch with her with a little networking, and will be meeting her. Yes, Darlene actually believes that she may have a photo of Mary! The identity of Mary's mother is completely unknown. She never came to America, so she probably died young in Sweden. I hope that I might find her name in Ole & Mary's wedding record, which I believe is probably with 1st Lutheran Church in St. Peter, MN. Darlene is helping me get in touch with that church. On Mom's side, three of Grandpa Beck's ancestors' whereabouts are almost, but not quite known. I know the exact dates and places where they died, but not where they are buried. This includes 3GGPs Helten (Grandpa's mom's dad's parents) and 4GGF Mueller (Grandpa's mom's mom's dad's father). 3GGF Helten actually lived and died right in the middle of Trier Township, between Calio and Munich, but Cindy says that she can't find him in the local cemeteries. I've seen his obituary, which does not indicate place of burial. I will try retrieving his death certificate from state archives in Bismarck, or a burial record from the Munich church or a local genealogical society. His wife died back in MN, where the family was settled near Lake Henry, Stearns County. 4GGF Mueller also lived and died in Stearns County. Neither of the MN death certificates state a place of burial, so I am having Kassie help me locate their microfilmed obituaries from a MN state library. In addition to locating where my ancestors are buried, I also like to see where they lived. I have been able to identify the exact plots of land owned by several ancestors. 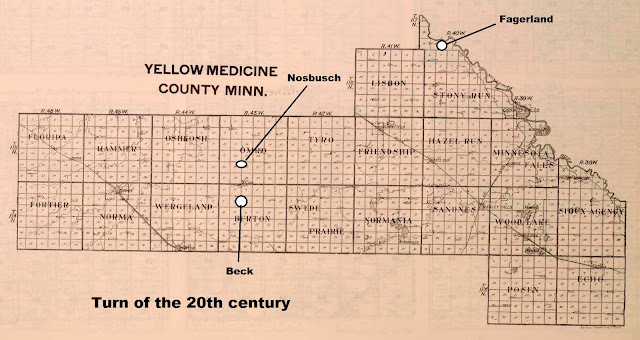 The house built by 3GGF Nosbusch (Grandpa Beck's dad's mom's father) in the 1880s might still be standing in Yellow Medicine County, MN. I will also look for a church built by 3GGF Wiltse (Grandma Fagerland's mom's dad's father) in Deering, ND in 1900. Of course, the house built by 2GGF Helten (Grandpa Beck's mom's father) still stands in Munich. I'll be visiting Little Bethany Church in Barnesville, MN, where my GGM Fagerland grew up and played organ a century ago. 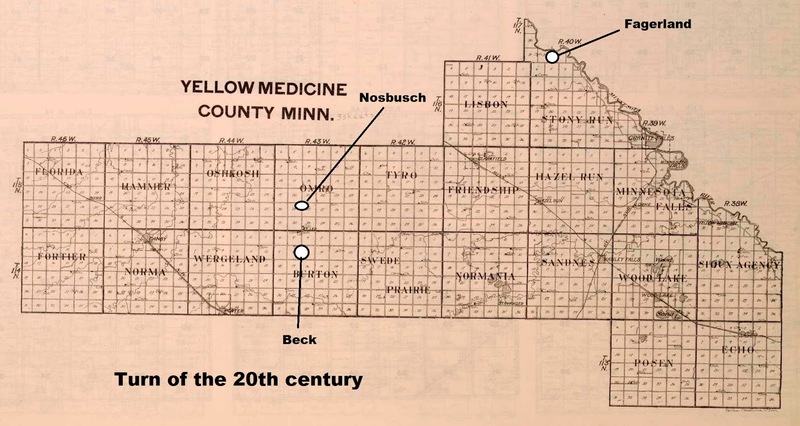 Yellow Medicine County, MN is a particularly interesting location. Mom's and Dad's ancestors both lived there from the 1880s - 1910s, though they did not know each other. They had no idea that their families would cross paths and their mutual descendants would come looking for them a century later! Some people may wonder why I bother chasing ghosts and graves. When I was in kindergarten, we used to love singing patriotic songs at school. That line, "Land where my fathers died" really stirred my imagination. If our forefathers are here and they are important enough that we sing hymns to them, why can't we find them?! In the internet age, it has gotten infinitely easier to research from home. What strikes me now is how these ancestors and the records to find them are right under our noses. It only seems fair to me that since I owe my life to them, the least I can do is make sure they're not forgotten. Besides that, I like to discover. It is an eye-opening feeling when the abstract concept of "ancestry" becomes individualized, one by one, into distinct life stories. You get a better understanding of your own origins and how your family fit into history. It essentially adds the whole new dimension of time to your family. My brother, sister, and cousins are raising children and keeping our family alive. Since I am not doing that, my interest has turned toward keeping the family's memories alive. 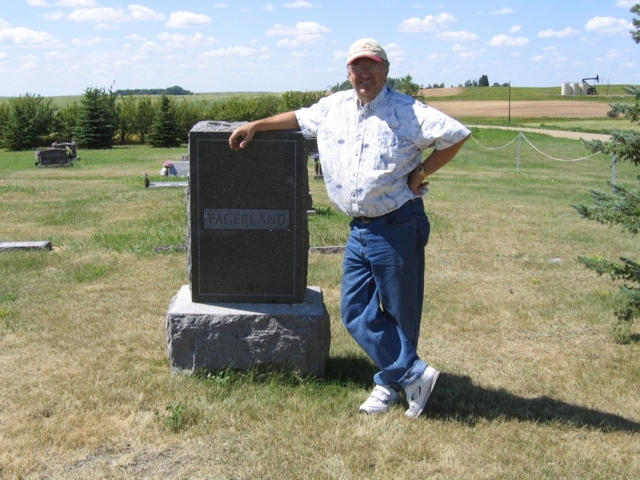 Dad at a Fagerland family grave in Noonan, ND in 2005. He'll be joining me for some ND gravechasing again this month. I'll be on the road for two weeks and may post updates on this site. I will certainly be posting some photos to my photography site in coming months, and by the end of the year I should have a photo book available that you can buy there. In the longer term, I am working on a book of ancestors that will profile them one by one.